Parke Kunkle is a fake! Home → Damien Zone → Parke Kunkle is a fake! According to our expert astrologer, Countess DeRenzatto, there is no change in the zodiac as claimed by some lunatic Parke Kunkle who is just trying to turn a buck by changing everything. Countess Renzatto is currently picking lottery numbers and doing precise horoscopes for the stars in Los Angeles and living with a well-known writer who is trying to get her into a reality show. See the details here —> DeRenzatto Movie Project. “Imagine all the money you would make selling geography books if parts of South America sank or drifted west,” said Countess DeRenzatto in a fit of anger. “This charlatan Kunkle just wants to start a whole new cottage industry because he is a third rate astronomer who needs money and fame. So, pay no attention to this new sign or any new zodiac stuff you see. It’s all a money-making scam. 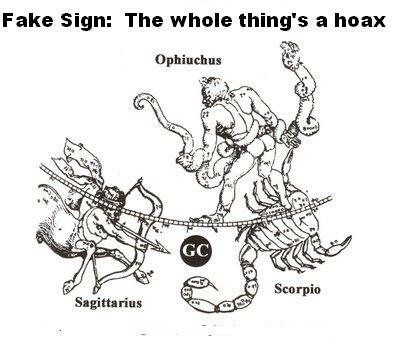 The new astrology sign Ophiuchus is fake. New Zodiac sign is fake. NOT THIS SAME OLD STORY AGAIN….! Parke Kunkle, the man who just now figured out that the Earth wobbles in its orbit creating precession and that the zodiacal path includes Ophiucus, there are actually two dozen constellations that brush the zodiacal orbit of the Sun, and its been known for thousands of years. Whether you follow astrology or not, this guy is a little slow on the uptake! Not too swift, this fellow. I would challenge the rest of the planetarium members in Minnesota to see if they couldn’t get some representation by someone a little more up to speed!